Our workshops for 2017 have once again been curated and organised by Jane Crowfoot and feature many well-known names. They are held at our quirky offices in the heart of Hampstead Village. Less than 5 minutes walk from Hampstead tube station on the Northern Line. 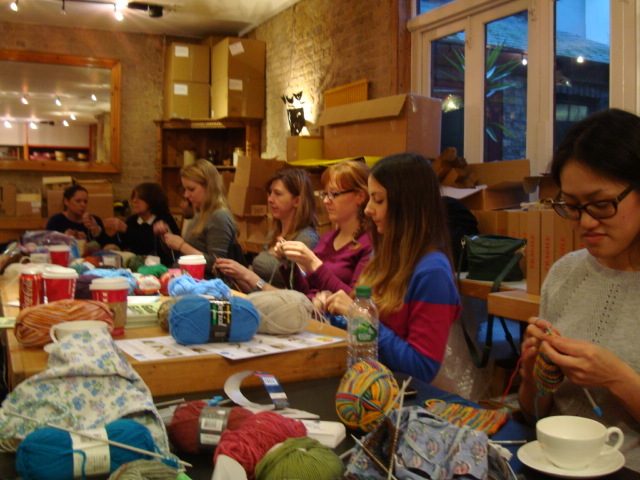 Knit for Peace is hosting its 1st KnitFest at Chelsea Old Town Hall, London with courses lead by famous designer including Jane Crowfoot, Sasha Kagan, Debbie Bliss and Renée Callahan. For more information please visit the KnitFest Courses page. By working through a small purse project you can learn some great crochet techniques! Within this workshop Jane will show you the various ways of adding beads to your crochet, how to work 2 colour crochet and how to work textural stitches and crab stitch. During the day you will also be given the chance to learn how to make a dorset button. A yarn kit and beads will be provided for the project but you will need to bring along a range of crochet hooks between 2.5mm & 4mm, stitch markers, scissors and a knitters needle for sewing up.